Another Patek Philippe limited edition watch presented yesterday to commemorate the manufacture's 175th anniversary, the World Time Moon Ref. 5575 combines the traditional world's 24 time zones with a highly realistic and large format moon-phase display at the centre of the dial. 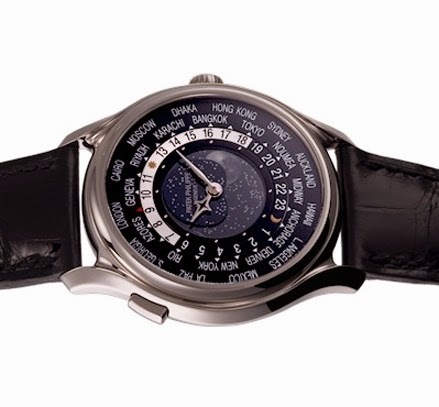 This is a relevant variation because traditionally Patek Philippe world time watches features a guilloché centre or a cloisonné enamel decoration. 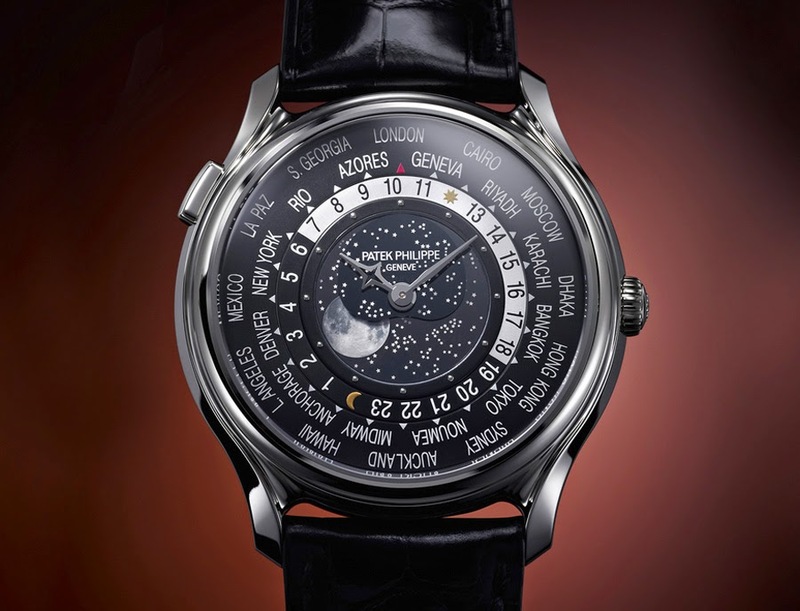 This is for sure the most realistic and prominent representation of the moon in a Patek Philippe timepiece. First launched in the 1930s and patented in 1959, Patek Philippe's World Time watches have a typical layout with two rotatable scale disks at the periphery of the dial. The outer scale lists 24 place names that each represent an entire time zone, while the inner scale displays the hours that correspond to the time of day in each zone. The hour and minute hands display the local time in the time zone represented by the city which stands at 12 o'clock. The cities on the right are located farther east, those on the left farther west. The adjustment of the local time is performed with a single pusher at 10 o'clock in the case flank. Very important, the mechanism is separated from the movement when corrections are made, so the steady oscillation of the balance and the accuracy of the minute hand's position remain unaffected. Each time the pusher is pressed, the Southern Cross-inspired hour hand advances by one hour, while the city and 24-hour disks move counterclockwise by one time zone. 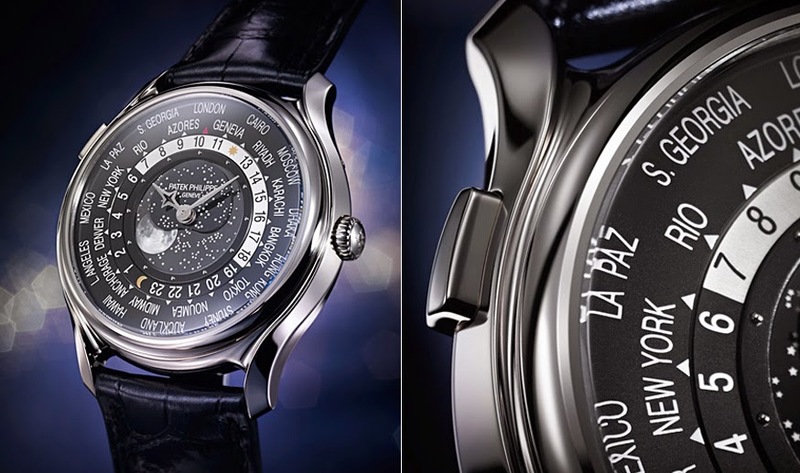 As a tribute to Patek Philippe' origin, the Central European Time is represented by the city of Geneva instead of Paris. 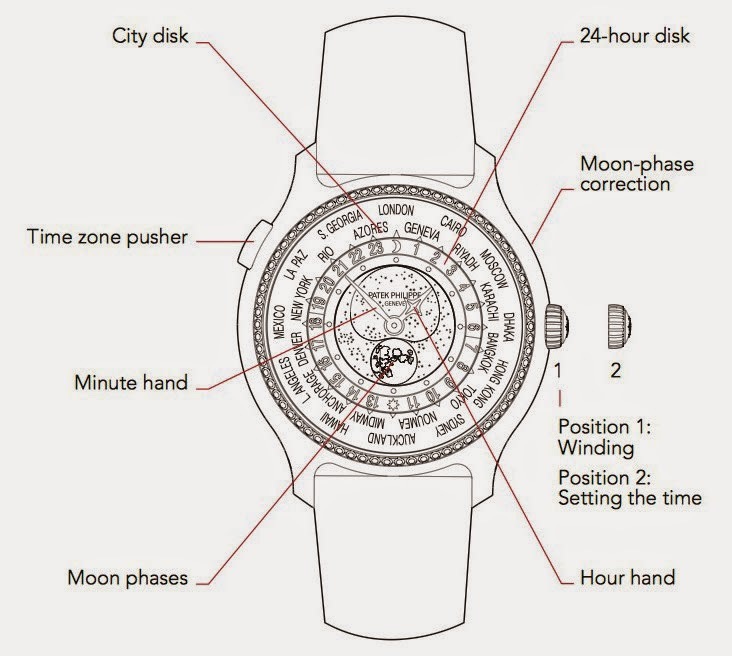 The moon-phase display mechanism is composed of two thin, superposed glass disks. The bottom one is decorated with the nocturnal sky and shows a richly detailed and very large rendering of the moon. This disk performs one complete revolution every 29.53 days. The upper half of the second stationary disk, characterised by a precisely calculated contour, acts as a mask exposing only the visible portion of the moon. The new Calibre 240 HU LU was developed explicitly for this timepiece and it is based on an ultra-thin self-winding movement powered by a 22K gold mini rotor recessed in the plate. 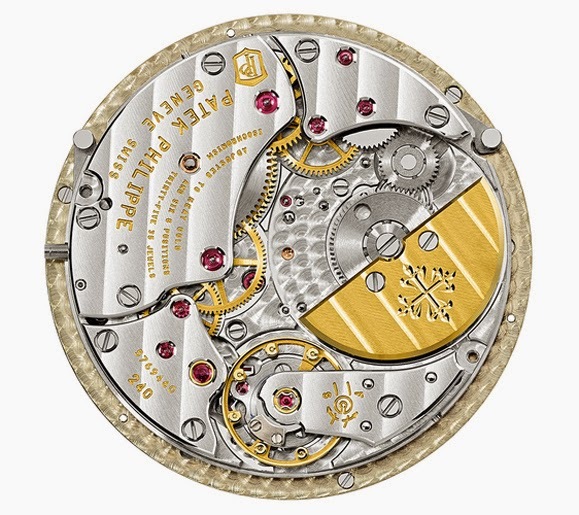 The round white gold case has a diameter of 39.8 mm and has a solid-gold case back with the engraving "PATEK PHILIPPE GENEVE 175e Anniversaire 1839 – 2014". The hand-stitched alligator strap is secured with a fold-over clasp in gold to match the case, with the engraving "PATEK PHILIPPE 1839 - 2014". The World Time Moon Ref. 5575G will be produced in a limited edition of 1300 pieces with a retail price of Swiss Francs 46,000. A diamond-adorned Ladies' version (ref. 7175R) in a 38 mm rose gold case will be crafted in 450 examples and priced at Swiss Francs 50,000. 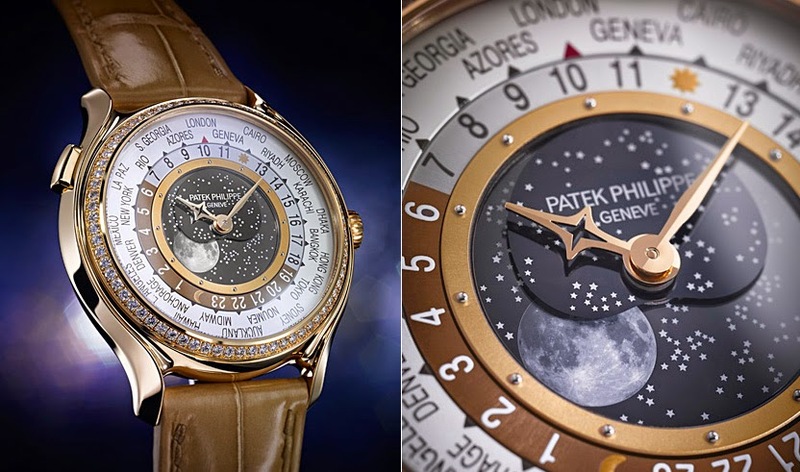 Patek Philippe World Time Moon Ref. 5575. Another Patek Philippe limited edition watch presented yesterday to commemorate the manufacture's 175th anniversary, the Patek Philippe World Time Moon Ref. 5575 combines the traditional world's 24 time zones with a highly realistic and large format moon-phase display at the center of the dial. The World Time Moon Ref. 5575G will be produced in a limited edition of 1300 pieces with a retail price of Swiss Francs 46,000. A diamond-adorned Ladies' version (ref. 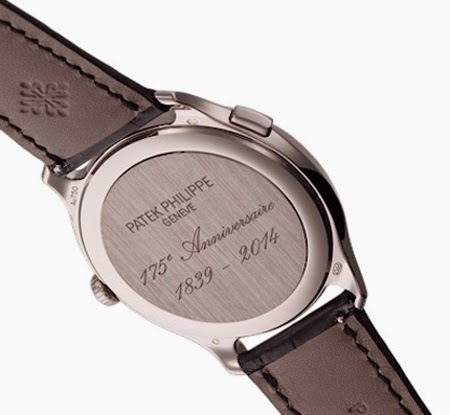 7175R) in a 38 mm rose gold case will be crafted in 450 examples and priced at Swiss Francs 50,000.